We’d love your help. Let us know what’s wrong with this preview of Lion of the Sky by Laura Purdie Salas. To ask other readers questions about Lion of the Sky, please sign up. A haiku book organized by season. The illustrations are very good and I love them, but the haikus were a bit «easy» or «light» I would say, probably not the best word, but just not deep enough for my taste even if there weren’t bad. I wasn't sure if I was going to like this one. Books of poetry for kids don't always work. But after flipping through the first few poems and pictures, I was sold. This book is comprised of what the author calls "riddle-ku". Basically, they're haiku that describe something, only it's not explicitly spelled out. The reader then has to figure out what each haiku is referring to. I think it would be great fun for a kid to sit down and try to figure these out. Some are easier than others (but if you I wasn't sure if I was going to like this one. Books of poetry for kids don't always work. But after flipping through the first few poems and pictures, I was sold. This book is comprised of what the author calls "riddle-ku". Basically, they're haiku that describe something, only it's not explicitly spelled out. The reader then has to figure out what each haiku is referring to. I think it would be great fun for a kid to sit down and try to figure these out. Some are easier than others (but if you do get stuck, there's an answer key at the back). The illustrations are a perfect complement to the poems. Some of them would be beautiful as framed art pieces. I'm going to have to see if I can find more of the illustrator's work. This is a beautiful book that introduces haiku to readers who might not be familiar with it. It's also a fun set of riddles. Evocative illustrations tie everything together. I highly recommend this one! I love children’s simple story books to push boundaries and present words and ideas in now and challenging ways. To entice and grab the young minds listening or learning to read. Pitched for 5 - 9 age group, I would read this to a child as soon as they enjoy the book time experience. Lion of the Sky is a collection Haiku for all seasons. Written by the clever and talented Laura Purdue Salas and wonderfully illustrated by Mercè López. The colour palate is a delight on the eyes and combined with the I love children’s simple story books to push boundaries and present words and ideas in now and challenging ways. To entice and grab the young minds listening or learning to read. The colour palate is a delight on the eyes and combined with the Haiku, short poetry over 3 lines that contain 5:7:5 syllables. In these they are riddles to help the child to explore their world more with the aid of word and pen & ink drawings. Covering the year we travel from Spring to Winter. From rainy days to playing in the snow. I loved this book and it is one that would be difficult to tire reading; the author even encourages us to write our own Haiku or Riddle-ku as shared here. I fly to the all! Marvellous and with the artwork so magical. Since this collection of poems is aimed at children, I rated it as such. I have to admit that I wasn't particularly intrigued by these poems, but they were good. I can imagine kids liking them for themselves, but what made me actually recommend this book to every parent with a toddler/kindergartner was that these poems are all riddles as well - they're so-called Riddle-ku-s. This makes reading this little collection more than a simple literary experience, it's a fun game this way, and it makes i Since this collection of poems is aimed at children, I rated it as such. I have to admit that I wasn't particularly intrigued by these poems, but they were good. I can imagine kids liking them for themselves, but what made me actually recommend this book to every parent with a toddler/kindergartner was that these poems are all riddles as well - they're so-called Riddle-ku-s. This makes reading this little collection more than a simple literary experience, it's a fun game this way, and it makes its little 'readers' actually think about what the poems are about. And that's not even the best idea in this book. The last page ask kids to create their own riddles, their own haikus. Sorry, Riddle-ku-s. I find this awesome! There are ideas and methods given as help, too. I have to say, I'd so much like to see what kids write after discovering this book! Just in time for National Poetry Month and for spring to turn toward summer, a presentation of the four seasons in a familiar form. It's a perfect riddle in haiku form to share with local readers with Thunder Over Louisville happening today (April 13). One of Laura Purdie Salas's new poetry collections (she is very busy this year with new releases) has landed in Room 407 and drew high engagement and rave reviews from one group of tee Just in time for National Poetry Month and for spring to turn toward summer, a presentation of the four seasons in a familiar form. One of Laura Purdie Salas's new poetry collections (she is very busy this year with new releases) has landed in Room 407 and drew high engagement and rave reviews from one group of teens with whom the book was shared on Thursday afternoon. we sprout on stems of people. As we work through multiple genres this year for our T.H.I.S. project, Laura's approach to haiku that presents a subject in riddle was a perfect mentor text for us to contemplate how we might present the complexities of our subject through micro form like haiku. And Laura does not disappoint in her rich tradition of not only being a wonderful poet for young readers but a rich resource in mentoring process of writing poetry as well. The back of this collection sees Laura offering advice to young writers who want to approach this genre for themselves (and some of our students immediately began to think of their subject and what parts are already complex or perplexing). In the epitext, Laura Purdie Salas shares that the idea for this approach to haiku began to take shape during National Poetry Month almost five years ago (mentor text in returning to ideas, especially those pulled together quickly and in bulk). The poet introduces the young reader to terms like American haiku, mask poems, and narrator. Included, too, are further resources on haiku and riddle poems (and an answer key. . .just in case you get stumped). New books to help introduce students to poetry are always a welcome find. This book has the added benefit of excellent artwork to enhance the presentation of the poems. A combination of haiku and mask poems, each one is a riddle told by a nonhuman narrator that the reader can guess from the clues within the lines. As if that were not enough, the poems also move through the seasons with descriptions of things experienced at each time of the year. The acrylic illustrations capture the beauty of dan New books to help introduce students to poetry are always a welcome find. This book has the added benefit of excellent artwork to enhance the presentation of the poems. A combination of haiku and mask poems, each one is a riddle told by a nonhuman narrator that the reader can guess from the clues within the lines. As if that were not enough, the poems also move through the seasons with descriptions of things experienced at each time of the year. For those wishing to use it as a poetry mentor text there is an author's note that explains about mask poems, haiku, and the use of the haiku form to create riddle-ku. There are also suggestions for further reading with books of haiku, riddle poems, and a few about the seasons. An answer key for each riddle is also provided. I received a digital copy of this via Netgalley. Thank you, Laura Purdie Salas and Millbrook Press! I was provided a free digital copy of this book by NetGalley in exchange for an honest review. Lion of the Sky is a really clever and beautiful collection of haiku that all feature different aspects of the seasons. Salas has done a wonderful job of making individual haiku fit into a greater, flowing, thematic story. The art is where this book shines. I read a digital arc, but I can't wait to get my hands on a physical copy so I can see all the illustrations in print. They were very vivid and imag I was provided a free digital copy of this book by NetGalley in exchange for an honest review. Lion of the Sky is a really clever and beautiful collection of haiku that all feature different aspects of the seasons. Salas has done a wonderful job of making individual haiku fit into a greater, flowing, thematic story. The art is where this book shines. I read a digital arc, but I can't wait to get my hands on a physical copy so I can see all the illustrations in print. They were very vivid and imaginative. "Lion of the Sky" creatively and poetically reflects how each of Earth's seasons (spring, summer, autumn/fall, and winter) might look, smell, sound, taste, and feel. The text and illustrations in this book are equally lovely and well suited for children ages 5-9. I received this book from NetGalley and the book's publisher in exchange for my honest review, for which I am very grateful. I read this book as part of a Netgalley request. A delightful kids book full of haiku and riddles! I wasn't completely sure what this book was when I requested it, but I was in the mood for some poetry. This book not only had some clever riddles, it has absolutely beautiful illustrations. A must for any children's library! 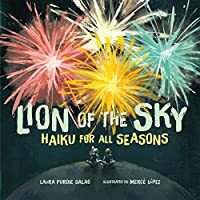 Lion of the Sky:Haiku for All Seasons is a fun filled, beautifully illustrated book of Haiku riddles. It’s the perfect book that will charm the 5-9 age group. Teachers can also use this book as a model for their Haiku lessons and the changing seasons. Students will definitely be motivated, not only to create a Haiku, but to solve riddles. I am looking forward to sharing these riddle-ku poems with students. What a FEAST of a book! The artwork was gorgeous and the riddle-kus were so lyrical. I absolutely LOVED fireworks being called Lions of the Skies! Love these riddles written in a haiku format! 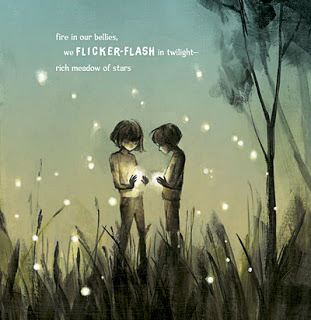 Beautiful illustrations accompany each poem. A cute book of illustrated haikus for children. Guessing what the haikus are about might be fun the first time around, but I can't see this holding a child's attention for subsequent readings. This was the last book I read it 2018 and it was a pretty book. I enjoyed the haiku poet and the art, I felt that they fit together, playing well of the words and paintings. Haiku could be my favorite poetry, I think because it's short yet powerful. Plus, it's easy and looked nice in my journals. This is a poetry book for children which I feel most children would like and enjoy, it's pretty while still having a nice flow from one season to the other season. Overall, this is a good read! The is a This was the last book I read it 2018 and it was a pretty book. I enjoyed the haiku poet and the art, I felt that they fit together, playing well of the words and paintings. Haiku could be my favorite poetry, I think because it's short yet powerful. Plus, it's easy and looked nice in my journals. Lion of the Sky is a really beautifully illustrated haiku book of poems through the seasons. The book illustrates everything from fireworks, to falling leaves and how a child experiences them. The haiku are beautifully written and descriptive. I really enjoyed this book. That is haiku in the form of riddles. I love haiku, so this was a great book for me. I also think the title and cover are fantastic. I also didn't realize I was reading riddle-ku, as the author calls them, but my mind was deciphering the clues anyway. A delightful book weaving daily life with seasonal changes of nature.in a kid-friendly format. #Poetry #Puzzle and #nature make a heady combination for the kids.The author also introduces a new form of poetry for kids "Riddle-ku!" encouraging young to think and connect with nature and natural phenomenon daily. I received an advance reader copy of this book via NetGalley in exchange for an honest review. This was adorable. I loved the premise, the execution, the illustrations. This is a book I would want to have for my (hypothetical) child. One poet whose work I've enjoyed for years is Laura Purdie Salas. This spring rea Although observations of everything about our world through poetry is welcome any month of the year, the annual celebration of National Poetry Month in April is when poets, those who enjoy poetry and those who have yet to discover poetry can come together. The use of various poetic styles is showcased. The interplay of word choices and cadence penned using those various techniques gives the appearance of pure magic. One poet whose work I've enjoyed for years is Laura Purdie Salas. This spring readers are fortunate to have three new books written by Laura Purdie Salas released. They are from three different publishing houses and illustrated by three different artists. 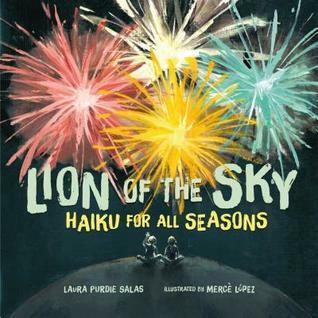 To start off the first week of National Poetry Month, Lion Of The Sky: Haiku For All Seasons (Millbrook Press, April 2, 2019) written by Laura Purdie Salas with illustrations by Merce Lopez was made available for all readers. It presents an entire book using a form of haiku and using these as riddles to be solved. Laura Purdie Salas calls it riddle-ku. I love haiku, and I love riddles. I also love Laura Purdie Salas. So, of course, I had to check out this book. Riddle-ku are a fun way to introduce the young reader to the haiku! A fun way to think and try to answer the riddles. Note that you should first read out the riddleku to your young one before they look at the illustrations (at least on the first read) so they can try to answer it without any help from the beautiful helpful illustrations. Se I love haiku, and I love riddles. I also love Laura Purdie Salas. So, of course, I had to check out this book. Seasons come and seasons go; each one puts on its own show! So make sure you enjoy all of it – heat, fall-colors, rain, and snow! Again, as with other books, a helpful resource is included in the last couple of pages. One of them is a quick guide to how to write your own riddle-ku. The second includes books for further reading and answers to the riddle-ku in the book. The verdict, well of course, it must be clear by now – I love this book too! Check out Laura Purdie Salas’ website for free activities and to share any riddle-ku you write. Lion of the Sky by Laura Purdie Salas is a charming collection of haiku centered around the seasons, accompanied by gorgeous artwork. The author calls these 'riddle-kus’ because each haiku describes a common object using riddle language, including I and me. At the end there's a section detailing how to write riddle-ku, and a section of suggested reading books. I read this with my cubs,cand we all enjoyed it. I've written haiku before, but it's been awhile and these poems inspired me to write poetry again. And my cubs to try for themselves! Recommended for those who love poetry. I received a free digital copy of this book from Netgalley for an honest review. I'm not a big fan of Haiku but I decided to try this collection anyway. This was a cute collection of children's poems. Loved the illustrations, too.